There is not much better validation for your product, business or website, than to display testimonials from real life customers and people. Having these show up in prominent areas of your website, where they can easily be seen and read, is a surefire way to grow trust with your audience. Adding testimonials to WordPress is not as straight forward as it could be though. As you may be aware, it cannot be done out of the box. You have to install a testimonials plugin as a first step and then configure it to fit your brand. Choosing the right plugin and knowing what to configure can get confusing. Don’t worry! We’ve created this guide as an ultimate resource on setting up testimonials in WordPress. We’re going to walk you through the step by step process of getting a plugin installed, all the way through to displaying them on the frontend of your website. Without further ado, let’s get started! To start off with (and as we discussed earlier), we need to find a testimonials plugin that can integrate with your WordPress theme. Here at WP Geeks, we’ve started building out our own testimonial plugin for WordPress. We’re pretty excited about it as it is jam packed with features and templates. Unfortunately, it’s not quite ready for release just yet! As soon as it does become available, we will make an announcement on our blog. Keep an eye out. In the meantime, we recommend that you install the WP Testimonials plugin which can be downloaded from the WP.org plugin repo. Go ahead now and download the plugin. Once downloaded, install it to your WordPress website and activate it. Once you’ve completed those steps, move on to step 2. Or potentially, you want to have the testimonials show on a combination of the above options. It’s really up to you, but you should make a decision as we’ll be adding the testimonials in step 4. Using the plugin we’ve recommended, all the configuration settings can be done in step 4 on the widget or the shortcode. We’ll get to that shortly. Great, we now know where we want to show the testimonials on our site, but we currently don’t have any to actually show. So let’s go and add them. Navigate to “WP Testimonials” on the WP Admin sidebar. Then click “Add New” to add a new testimonial. Fill in the data fields that are applicable to your business or website. Create as many testimonials as you have available. You can also categorize your testimonials using the “Category” taxonomy on the right hand side. Finally! It’s now time to display the testimonials on your WordPress site. Remember in step 2 we discussed your options for display? Cool, you’ll use that now as we’re going to go through adding the testimonials using both the shortcode (for post/page content) and widget (for a repeating sidebar). If you want to show the testimonials on your sidebar, then navigate to “Appearance” and click “Widgets”. Locate the “WP Testimonials” widget and add it to your sidebar. You now have a ton of configuration options available to you. You are able to edit the design, how many testimonials should show up and many more settings. Configure the options that are relevant to your website, brand or theme. Once you’ve saved the posts, pages and/or sidebar widget, go ahead and visit the site on the frontend to make sure that it is all displaying as you expected. You may have a bit of back and forth here, tweaking the styling and configurations as you go. Lastly, before we sign off. We definitely recommend that you add a form to allow your visitors and customers the ability to submit testimonials. 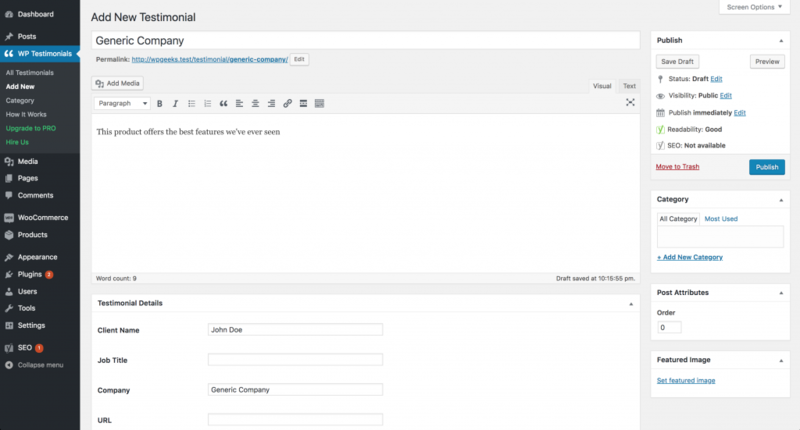 You can do this using a WordPress plugin like Contact From 7 or Ninja forms. And that’s all there is to it. We hope you found this guide super useful. Do let us know if you ran in to any hurdles and we’ll try our best to help you out in the comments below.